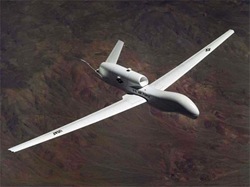 RQ-4 Global Hawk unmanned aerial vehicle (UAV) can stay in the air for more than 24 hours. It has a range of 3,400 miles and can maintain altitudes of 65,381 ft. Normally the military would have control over things such as these, but the Global Hawks have been turned over to NASA for environmental research flights. NASA is said to be interested in climate research. The first flights of the Global Hawks should take place in January. Previously U2 spy planes have been used for scientific research. However, the UAV’s are a much better choice because they require less fuel, and people to operate. Thus they are a cheaper and safer to operate.